Jeremiah 50:6 My people have been lost sheep: their shepherds have caused them to go astray, they have turned them away on the mountains: they have gone from mountain to hill, they have forgotten their resting place. 10 Thus saith the Lord GOD; Behold, I am against the shepherds; and I will require my flock at their hand, and cause them to cease from feeding the flock; neither shall the shepherds feed themselves anymore; for I will deliver my flock from their mouth, that they may not be meat for them. 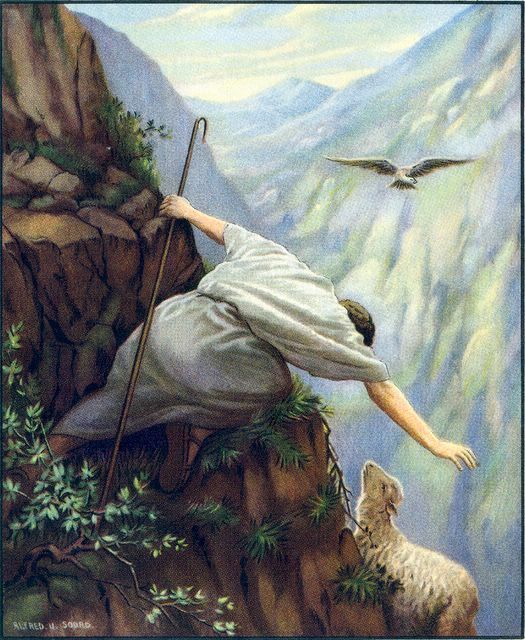 12 As a shepherd seekers out his flock in the day that he is among his sheep that are scattered; so will I seek out my sheep, and will deliver them out of all places where they have been scattered in the cloudy and dark day. 23 But he answered her not a word. And his disciples came and besought him, saying, Send her away; for she cried after us. 5 And whoso shall receive one such little child in my name receives me. 12 How think ye? If a man have a hundred sheep, and one of them be gone astray, doth he not leaves the ninety and nine, and goeth into the mountains, and seekers that which is gone astray? 13 And if so be that he find it, verily I say unto you, he rejoices more of that sheep, than of the ninety and nine which went not astray. 2 And the Pharisees and scribes murmured, saying, This man received sinners, and eaten with them. 4 What man of you, having a hundred sheep, if he loses one of them, doth not leave the ninety and nine in the wilderness, and go after that which is lost, until he finds it? 6 And when he cometh home, he called together his friends and neighbors, saying unto them, Rejoice with me; for I have found my sheep which was lost. 7 I say unto you, that likewise joy shall be in heaven over one sinner that repented, more than over ninety and nine just persons, which need no repentance.